Lenovo's Moto C-series is meant to cater to first time and basic consumers looking forward to buying a low-cost entry level phone. The Moto C Plus is one such handset that serves as an online alternative to Xiaomi's popular Redmi 4. Let's talk about the Moto C Plus design and build first. It is essentially made of plastic and looks like a chunky, cheap and plasticky derivative of other 5th generation Moto phones like G5 and G5 Plus. It's not a bad looking phone, though. The display on the front is 5-inches in size and has 720p resolution. The Moto C Plus features and specifications are quite modest too. The handset is powered by 1. 3GHz quad-core MediaTek MT6737 processor paired with 2GB RAM and 16GB storage. You can also add up to 32GB of microSD storage. Moto C plus camera performance relies on the 8MP front camera with LED flash and f/2.2 aperture lens and the 2MP selfie camera with f/2.8 optics. Which is to say, you should expect too much in terms of photography here. The front camera also has a LED flash, but with basic hardware, it can only help so much. The sart Moto C Plus feature is its 4100mAh battery that also supports fast charging. Connectivity options include 4G VoLTE, WiFi, Bluetooth 4.2, and GPS. The Moto C Plus is again a basic phone that looks good, though not premium and is meant for first time and basic users. Also, it's one of the rare few phones in this budget that offers Android Nougat out of the box as of now. 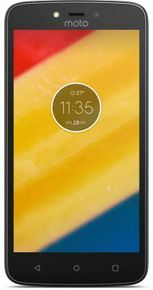 Moto C Plus Flipkart price is 6,999 INR, which is also the lowest price of Moto C Plus in India. If you are frustrated by failure in buying the base Redmi 4 variant, you can consider Moto C Plus as an alternative.